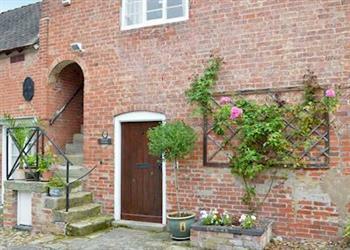 Orchard Cottage in Dalbury near Mickleover sleeps 6 people. Orchard Cottage near Mickleover is set within a historic setting and adjoining the friendly owner’s Old Rectory; Orchard Cottage (curtilage listed Grade II) is spacious, warm and comfortable. Surrounded by four acres of grounds in a truly rural environment with much wildlife, it makes a perfect base in which to relax and unwind as well as a superb location to enjoy the surrounding Peak District The open plan kitchen, dining and living area provide a social environment and the private enclosed garden is perfect for dogs and children to enjoy the great outdoors. In the midst of fabulous countryside, the stunning hamlet of Dalbury has a handful of houses, farms and an historic church. It offers walkers and cyclists beautiful scenic routes, with the facilities of the UK’s most central city of Derby, or the beautiful market town of Ashbourne both easily accessible. Derby can be reached in around 20 minutes and has everything from great shopping, music festivals, and reportedly the best ale houses in England (but there are several about 10 minutes away). Historic Ashbourne is around 25 minutes away and is home to quaint cobbled streets, a variety of good pubs and restaurants, and antique hunters are well catered for although the local salerooms, featured on TV, are about 10 minutes away. The traffic-free cycle route of the Tissington Trail starts in Ashbourne and running for 13 miles, passes through spectacular Derbyshire Dales countryside. A local traffic free cycle track is 2 miles away. Idyllic Dovedale, a renowned beauty spot, is around a 40-minute drive, and as part of the National Trusts Ilam Park, it offers a whole host of things to see and do. Kedleston Hall (National Trust) is 20 minutes away. Outdoor and water sports enthusiasts are spoilt for choice at nearby Carsington Water (30 minutes) or Mercia Marina (15 minutes), or those big kids can enjoy the thrills and spills of Alton Towers which is just 35 minutes away or racing at Donington Park in much less. The attractive and ever-popular market town of Bakewell and elegant Chatsworth House can be reached in around an hour, making this a superb location to be enjoyed at any time of year. Orchard Cottage can be booked together with Rectory Cottage (ref 411018) to accommodate up to 10 guests. First Floor: Open plan living space: With beams and doors to balcony. Lounge area: With open fire, double sofa bed (for flexible sleeping arrangements), Freeview TV and DVD player. Kitchen area: With electric cooker, microwave, fridge, freezer, dishwasher, washing machine and tumble dryer. All oil, electric, bed linen and towels included. Initial fuel for open fire provided. Travel cot and highchair available on request. Wi-Fi. Enclosed lawned garden with furniture. Bar-be-que. Ample parking. Cycle store. No smoking. NB: Bedroom 3 is accessed only by bedroom 2. Holidays at Orchard Cottage run from Friday to Friday. Pets allowed at Orchard Cottage. For a better idea of where Orchard Cottage is, you can see Orchard Cottage on the map below. Orchard Cottage is in Derbyshire; should you be on the lookout for a special offer, you can find all the special offers in Derbyshire. It's always worth checking to see what is on offer at the moment. Do you want to holiday near Orchard Cottage (UK4004), you can see other cottages within 25 miles of Orchard Cottage; have a look to find your perfect holiday location.